This recipe — from the Julia M. Pitkin cookbook [%amazonProductLink "Specialties of the House" asin=1888952008] — is a rich, spicy baked-egg dish that's perfect for large brunch parties. Preheat oven to 350 degrees. Grease a 9-by-13-inch baking dish. Combine all the ingredients except for the salsa and sour cream in a large bowl. Scrape the mixture into the prepared baking dish. Bake for 45 to 60 minutes, until the dish is set (the middle is no longer jiggly). Remove from the oven and let cool briefly. 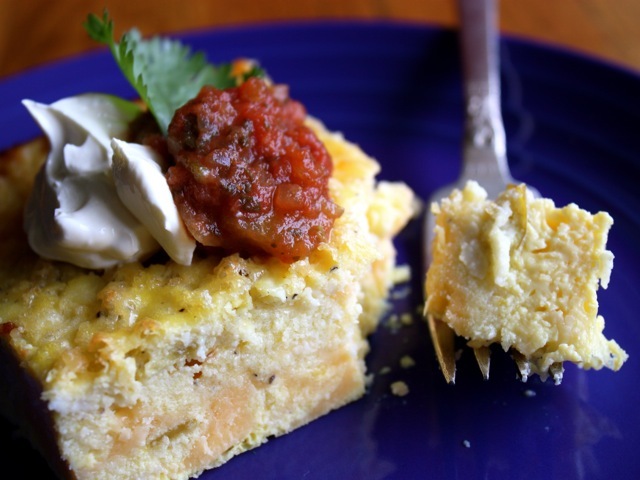 Slice into squares and serve in the baking dish, with bowls of salsa and sour cream on the side as optional toppings. You can bake this dish a day ahead of time, chill it in the fridge overnight, and reheat it the next day (at 350 degrees for about 15 minutes) before serving. Or mix together the ingredients in a bowl the night before and bake it in the morning.